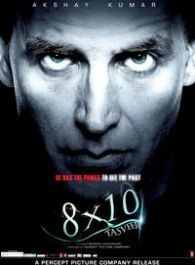 8X10 Tasveer is a story about young man named Jai Puri, (Akshay Kumar), who possesses supernatural powers. Jai is of Indian origin who works as a forest ranger in Canada. His life is shattered by a loss of a very important person in his life. This personal tragedy leads him to use his unique supernatural power to unravel the mystery behind the murder. 8x10 is supernatural thriller with a nail biting finish to come up with startling answers. Mod Movie Review Recommended for those with a heart! It's 3 Idiots for Akshay Kumar!